We are in the midst of the Save The Tree campaign. We have a weeping birch in front of the house and we’ve noticed of late that alot of the leaves are turning brown. We took a branch to Golden Acre, from whom we bought the tree 4 years ago. They instantly diagnosed a kind of caterpillar infestation and an insecticide cure. So we are removing as many of the infected leaves as possible before spraying the stuff, which I’ve confirmed is plant and pet friendly. Fingers crossed! I’ve been working on World Mail Panel postal surveys for a few months now, and as of the end of July I will have enough points to redeem a $50 credit with PayPal or Amazon. So that will be fun. Or I might just continue on and wait until I have $100. Hey if I wait long enough I could have enough to buy all of my Christmas presents….hmmmmm…..
Wrote a few pages with my Coleto pens, which I don’t usually do. 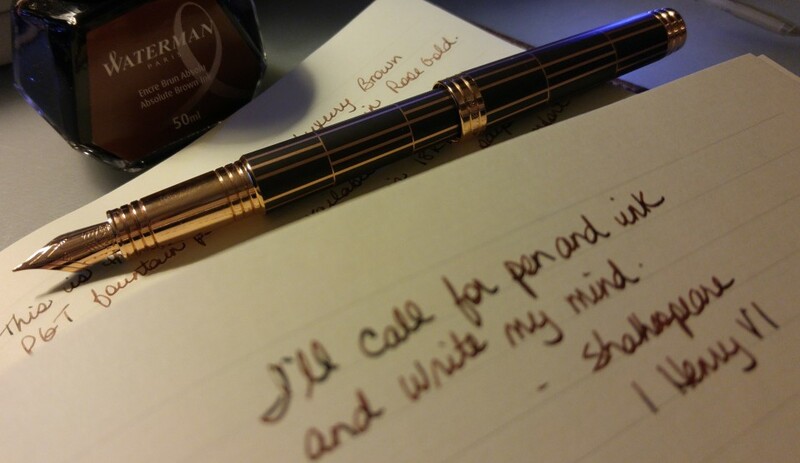 Love those pens. Got a really bad burn on my chest, which is odd for me because I usually avoid the sun as much as possible! I look like I’ve been branded. Oh well at least I was making Vitamin D like crazy. 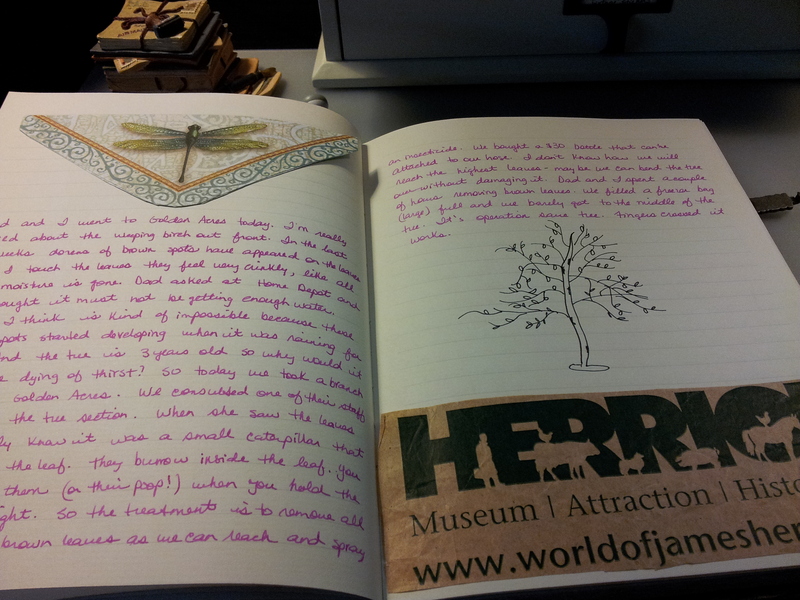 Here is a picture of my journal discussing our Save the Tree project. Until next week, happy writing! Hi! Can you explain a bit more about the World Mail Postal surveys? I checked out their site, but I can’t figure out what they’re testing. It sure sounds easy and I definitely like the Paypal/Amazon credits! Thanks! Sure eSeN! I don’t know if you saw my blog post: https://inlovewithjournals.wordpress.com/2014/04/07/world-mail-panel-postal-surveys/. I explain a bit about what I do for them in that post. Basically they are testing the speed of the mail delivery system in each country. They send transponders and every time a transponder moves through an electronic checkpoint (like an airport or a post office) data is collected. So far I’m enjoying getting mail almost every day from all over the world, and the credits are, of course, a nice bonus. Let me know if you have any more questions. And thanks for commenting! You’re welcome! I don’t remember everything I’ve written about so why should you? 🙂 I keep meaning to do an index….. The beginning of this tale began on a brisk October day. It was before noon and it had been raining that morning. At the end of a long and winding trail, there it sat. It had the appearance, at first glance to have been there a long time. But the blood was still fresh, still wet, though it had rained the blood was still thick and red. Not brown like old blood. It was then I noticed the flesh had began to rot. I remember thinking where is the smell. I think that is really when the fear of what I was seeing hit me. This couldn’t be, there is something wrong, but I could not think it through, for the fear was gripping me. I couldn’t even move. Why fear I could not even come to grips with it. As if to answer my internal question it happened, it faded into nothing. Gone. That was when fear turned to horror. That doesn’t happen in this world, things don’t just disappear. So who would believe such a thing, who can I share this horrifying event with…. No one will ever believe this. Then the mind starts, did it really happen, there is no trace to what your eyes told me… my brain stated. Thanks, I don’t know if I will discover what “more” is. It just came to me as I was winding down from the day. I will have to see if there is more to this tale or not…. Just a weird set of events that was set to pen and ink.